The post to which you hinge should be on a true vertical. If it is only slightly "off kilter", you can adjust the distance of the hinge pin from the post to account for minor tilt. If the post, above, was tilted to the right near its post cap, for example, you could adjust for this by having the bottom strap hinge installed slightly to the right of the top strap hinge. You can test how level your gate is installed, by placing a level along the top of the handrail, as you mount your hinges. For gates over 32" wide, we recommend that there be at least 3 screws screwed into the post. Some strap hinges only have two. If the latch post is not parallel to the mounting post, it is still generally best to mount the gate as level as possible. However, in some installations, you may choose to have the gate slightly off-level in order to "trick the eye". The goal is to have the gate fit in well with its surroundings! We recommend sealing your gate and allowing its natural color to grey over time. You may use any exterior wood stain or wood paint, however. With paints, you must prime the gate at least twice, first. To help your gate close, you can mount a gate spring to the underside of your gate. You mount one end to the bottom side of the gate (about 3-7 inches away from the post, depending on the spring length and stiffness). The other end affixes to some point behind the gate. This is an easy $3-10 solution to have your gate "close by itself". Our gates, being light, do not need expensive springs. A small one will do. Two door gates, in particular, benefit from the use of springs. On the latch side, behind the gate, you can also screw in a piece of 1x1 or 2x2 pressure-treated lumber, the same height as your gate, to form a doorstop. When the door closes, it will give a nice solid thump, as it reaches the stop. Use strap hinges for your gates, to ensure your gates won't sag over time. You will need two strap hinges per door. One goes on the handrail, and the other on the footrail. If you have a double door gate, you'll need four strap hinges. The strap hinge portion on the hand and footrail should be at least 20% the width of the gate. 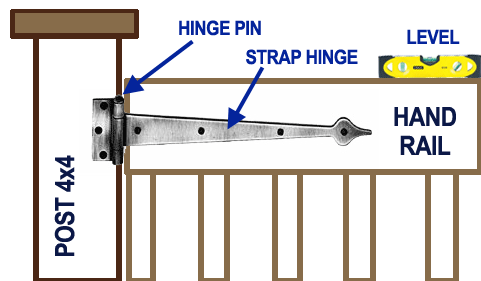 Examples of strap hinges are here. Installation instructions are included in every box. Water sealing. Once installed, we highly recommend that you treat your gate with Olympic Clear Waterguard for a long life outdoors. Hardware is not included with your gate because so many styles are at your local store! Click +1 if this helped explain strap hinges!